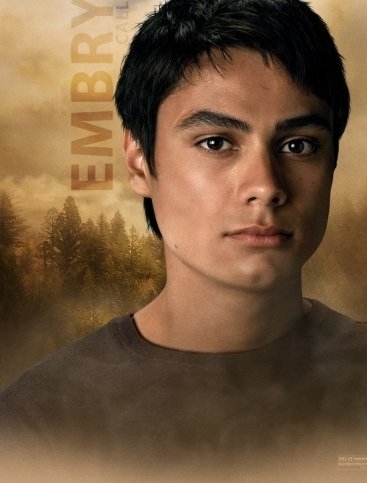 Personal history: Embry, along with Quil, was Jacob Black’s best friend. Embry was supposedly named after a soap opera star, but he didn’t tolerate anyone teasing him about the origins of his name. (NM6 p. 138) Embry’s parentage was a bit of a mystery. His mother came from the Makah reservation while pregnant with him – but only Quileute natives shape shifted, so Embry’s father had to be one of the Quileute elders. Embry might be half-brothers with Quil, Jacob, or Sam (EC19 p. 418). When Embry first met Bella in Jacob’s shed, he was shy but became animated when discussing the motorcycle repairs and hooted at Jake’s next “date” with Bella (NM6 p. 139).